LBD & ONESIES - A Lifestyle Blog: Blog Makeover! If you have noticed, I had my blog revamped recently! Nira, a friend of mine, made the layout for me and she made it in such a short span of time. She is actually one of the students I handled at St. Scho Manila's Pep Squad before. She's a figure skater and a blogger, too. Check out her site at http://niraballena.blogspot.com/! 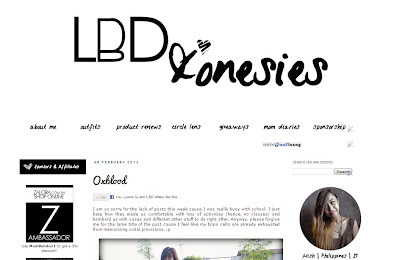 For my blog's layout, I wanted something simple and minimalist and I think she did a wonderful job with the layout! Hope you like my blog's new look! Simple, but pretty and clear. Definetly a step forward! Well done! Love the minimalistic feeling of it! Will follow anyone that follows me.